A French composer born August 7, 1959. 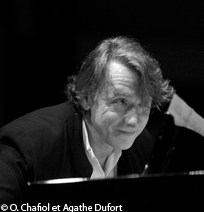 After studying at the Mons Music Academy in Belgium, taking an advanced orchestration course at the Berklee School of Boston (USA) and winning a First Prize for composition at the Paris Conservatory, Patrick Defossez obtained his certificate of aptitude for teaching jazz and improvised music. Since 1999 he has been in charge of the electro-acoustic studio and the contemporary music ensembles at the Bayonne-Côte Basque Conservatory. An improviser pianist and composer attracted by various aesthetics, a champion of doing away with the separation of genres, he favours an “art of compositions”, a “polyphony of styles” between contemporary art music, electro-acoustic music, mixed music and improvisation. A member of the composers’ collective 2d’Lyres, he has collaborated with Anne-Gabriel Debaecker on various projects, including the opera TousUn (2003), and he introduces into his works the poetic arts, the visual arts (Cascades immobiles, 2000) and the audiovisual, notably interactive video. Patrick Defossez also undertakes research into rare acoustic instruments (baritone oboe, blue harp, didgeridoo, traditional instruments of the Landes region in France…), electronic keyboards and the piano (108 coups de cloches ... for two pianos and optional equipment, 2007; Double for two pianos, 2008; Concerto for solo piano, 2012). Les partitions de Patrick Defossez sont éditées par les Éditions Participatives 2d'Lyres.